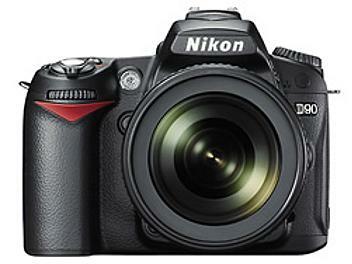 The Nikon D90 is a prosumer 12.3 megapixel DSLR camera. D90's 12.3 effective megapixels provides outstanding resolution, delivering images with extraordinarily defined detail and expanded enlargement capacity. The extremely wide sensitivity range of ISO 200 to 3200 delivers incredibly low-noise characteristics throughout. Furthermore, sensitivity can be increased to Hi 1 (ISO 6400 equivalent) and decreased to Lo 1 (ISO 100 equivalent) to expand shooting versatility. The camera also employs an Image Sensor Cleaning function that works to free image-degrading dust particles from the sensor's optical low-pass filter. Nikon's comprehensive digital image-processing EXPEED technology is optimized for the D90 to realize the high-quality, high-speed image processing capability. EXPEED also contributes to the outstanding performance of other powerful features such as Live View and the new Face Detection System. The D90 offers Nikon's new D-SLR movie function, allowing you to shoot 320 x 216 pixels, 640 x 424 pixels or HD720p (1,280 x 720 pixels) movies at the professional smoothness of 24 frames per second in motion JPEG format. The D90's sensor, which is much larger than the sensor of a typical camcorder, ensures higher image quality and exceptional low-noise, high ISO sensitivity performance, even during movie shooting. Capturing creative movie clips or the drama of life's moving moments is further enhanced by the wide selection of incredibly sharp NIKKOR interchangeable lenses that are available, from fisheye to wide-angle to super-telephoto. And Micro NIKKOR lenses bring the magic of extreme close-up imagery to movie making. Note: Autofocus and some other functions are not available when recording movies. The D90 precisely reads the color and brightness information of each scene from the 420-pixel RGB sensor, and applies this to auto focus, auto exposure and auto white balance. The D90 also recognizes human faces using the new Face Detection System, data which is incorporated during calculation, resulting in faces with newfound definition and accuracy as well as enabling face priority AF in Live View mode and immediate zoom into people's faces in playback zoom. One press of the Live View button activates the D90's Live View mode, delivering a bright, crisp image to the 3-in., approx. 920k-dot color LCD and allowing comfortable shooting without looking through the viewfinder. There are three contrast-detect AF modes that let you focus on any point in the frame: Face priority AF automatically detects up to five faces and focuses on that calculated to be the closest. Wide area AF offers a large AF area suitable for handheld shooting, and normal area AF provides focus with pinpoint accuracy when using a tripod. And when Nikon VR (Vibration Reduction) lenses are in use, photographers will enjoy the benefit of a VR-smoothed image, even in Live View mode. Nikon's Picture Control System enables users to customize the look and mood of images. Six original setting options are available Standard, Neutral, Vivid, Monochrome, Portrait and Landscape for easy customization of image preferences. The D90's Active D-Lighting accurately restores details in the shadows and highlighted areas, which are often lost in high-contrast lighting situations, by localizing tone control while shooting. There are four levels, including the new 'Extra High'. Active D-Lighting can be used manually or set to Auto mode. It is also possible to bracket your pictures, allowing the capture of one image with Active D-Lighting and one without. Thanks to the Multi-CAM 1000 autofocus module, the D90's 11-point AF system offers fast and precise autofocus coverage across the frame with the most sensitive AF sensor operating from the center. In addition, the D90 features versatile AF-area modes to handle most shooting situations: Single-point AF is recommended for stationary subjects, dynamic-area AF for moving subjects, auto-area AF for spontaneous shooting and 3D-tracking (11 points) AF for when you want to change the composition after focusing on your subject. The D90 has a precise eye-level pentaprism viewfinder with approx. 96% (centered) frame coverage and an easy-to-view 19.5 mm eyepoint (at -1.0 m-1). The built-in 16-frame superimposed grid display can be activated to assist in the creation of better-balanced compositions. The D90 features Advanced Scene Modes: Portrait, Landscape, Close-up, Sports and Night Portrait. These modes not only adjust exposure and image processing, but also judge the optimum Active D-Lighting and Picture Control settings to obtain the best results. The D90 also recognizes if VR (Vibration Reduction) is on or off and minimizes noise even in dimly lit scenes. The D90's designers incorporated a wide variety of image editing functions, making it easy for users to enhance images within the camera. The D90 introduces several new retouch options: Distortion Control adjusts lens aberration, Straighten corrects inclinatio of the image, while Fisheye produces optical effects similar to a fisheye lens. Gives you quick response, with 0.15-second start-up, 65 ms shutter release time lag (CIPA standard) and 4.5 fps continuous shooting. 3-in., approx. 920-k dot high-resolution LCD monitor with wide viewing angle that lets you change composition of the frame during shooting from various angles and easily confirm your image during playback. Built-in flash with 18mm lens coverage, Guide Number of approx. 17/56 (ISO 200, m/ft., 20oC/68oF) and Nikon's original i-TTL flash control; works as a commander; controlling up to two groups of remote Speedlights. Highly efficient energy-saving design allows approx. 850 images on a single charge of the Rechargeable Li-ion Battery EN-EL3e (CIPA standard, with AF-S DX NIKKOR 18-105mm f/3.5-5.6G ED VR, with 50% of pictures taken with flash). Extensive playback functions offer ample options for viewing and selecting the right shot, including 72-frame playback, calendar playback and histogram display for magnified portion of the image. Versatile Pictmotion menu creates slideshows combining five choices of both background music and image effects. Compatible with HDMI (High-Definition Multimedia Interface) output. Supports the Nikon Creative Lighting System when using the SB-900, SB-800, SB-600 Speedlight, or Wireless Close-up Speedlight System R1C1; ensures accurate exposures via i-TTL flash control. Flash Control: 1)TTL flash control with 420-pixel RGB sensor; i-TTL balanced fill-flash and standard i-TTL fill flash available with SB-900, 800, 600 or 400, 2) Auto aperture available with SB-900, 800 and CPU lens 3) Non-TTL auto available with SB-900, 800, 28, 27 or 22s 4) Range-priority manual available with SB-900, 800. Self-Timer: Electronically controlled timer with duration of 2, 5, 10 or 20 s.